Business owners are in charge of getting the right people on the bus and in the right seats. The business plan provides the destination and direction. But before owners commit to a budget, they need to make certain they have the right people. 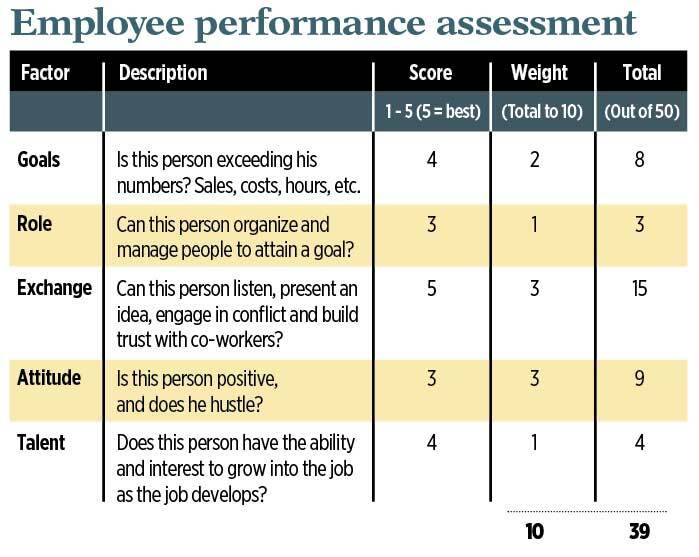 Too many owners and managers avoid the uncomfortable work of assessing and addressing an employee’s poor fit and performance. As a result, companies stick with the wrong crew and it hurts financials. Addressing performance starts with the owner. Often, the owner is part of any company problem and should address leadership, but the business has to flex to address his strengths and weaknesses. A sound plan with the wrong people is far worse than an average plan with the right people. Every company has problems, and at the root of every problem are people. The Peter Principle exists, personal agendas hinder productivity and poor chemistry can savage communication and cooperation. The basic question is: Are the key people holding the company back, or are they advancing its success? I’ve used a simple process to assess performance. I use the scoring to assess each factor and the weight to assign its importance. There’s nothing magic about the numbers. They’re used to clarify relative fit and performance. Of all the factors, nothing kills group performance quicker than poor attitude and low exchange IQ, which is the ability to deal with people and conflict. Armed with this assessment, owners can provide feedback to improve individual contributions. Perhaps more importantly, it allows owners to compare and contrast personal assessments as a group in light of the owner’s strengths and weaknesses and the condition of the business—fast growth, low profits, etc. In the simplest terms, what an owner lacks and what the business needs determine whom and what he needs on the bus. Several years ago, this assessment revealed a problem that was hampering one company’s profits. It uncovered a common situation: long-term, loyal people in charge who are willing but unable to grow and handle the management needs of a larger company. In this case, a key person—who ultimately stayed with the company but in a position of lesser responsibility—was identified as a bottleneck in the operation. Although the company was excellent at client relations, it didn’t communicate internally very well. To compound the problem, it was ineffective at conflict management, a skill required of every good manager. The answer was to keep the veteran manager on the bus but move him to a new seat. To date, the new manager in that position is doing the job the company needs done, and profits and morale reflect the change. Before owners build their budgets, they need to assess and address the people on their bus and sit them in the right seats. It makes a significant difference, resulting in less drama and more restful evenings. Kevin Kehoe, the owner and manager of 3PG Consulting, is a columnist for Landscape Management. Reach him at kevinkehoe@me.com.